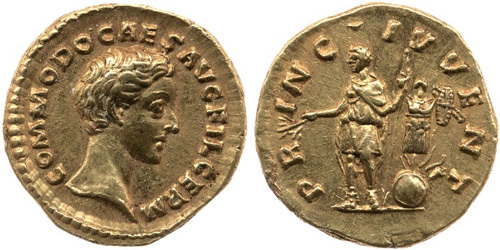 L. Aelius Commodus, son of Marcus Aurelius and the younger Faustina, was born at Lanuvium 161. He was made Augustus and co-emperor in A.D. 177. Commodus was strangled on the 31st of December, 192. Obverse: COMMODO CAES AVG FIL GERM, Bare-headed and draped bust right. 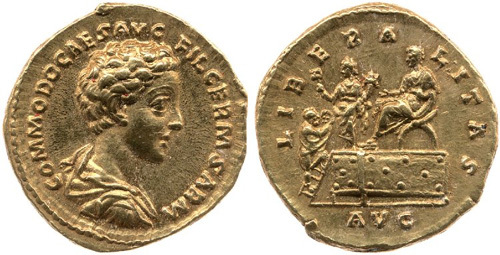 Reverse: LIBERALITAS AVG, Commodus, togate, seated left on platform in curule chair; in front, Liberalitas, draped, standing left, holding abacus in right hand and cornucopiae in left hand; citizen, standing right, at foot of steps. 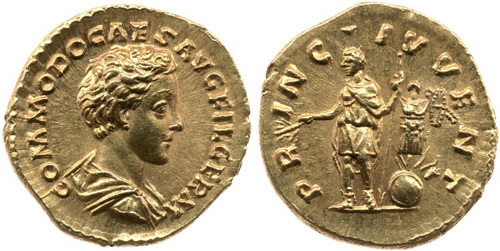 Reverse: PRINC IVVENT, Commodus, standing left, holding branch in right hand and sceptre in left hand; on right, trophy with arms at base. Obverse: COMMODO CAES AVG FIL GERM, Bare head right. Obverse: COMMODO CAES AVG FIL GERM SARM, Bare-headed, draped and cuirassed bust right. 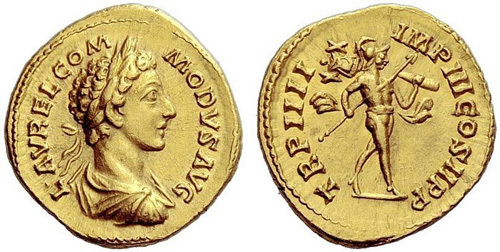 Reverse: ADVENTVS CAES, Commodus on trotting horse right extending right hand. 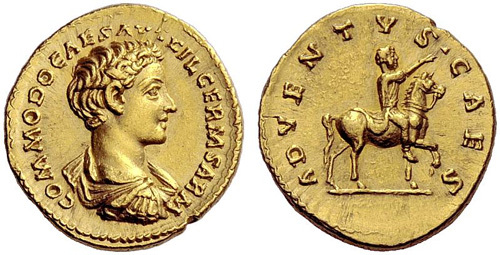 Reverse: DE GERMANIS, Two captives seated back to back at foot of trophy. Obverse: COMMODO CAES AVG FIL GERM SARM, Bare-headed and draped bust right. Reverse: PRINCIPI IVVENTVTIS, Altar inscribed FORT REDVCI. Reverse: SPES PVBLICA, Spes advancing left, holding flower and raising skirt. Obverse: IMP CAES L AVREL COMMODVS GERM SARM, Laureate and draped bust right. Reverse: TR POT II COS DE GERM, Pile of arms: cuirass, shields, spears and other arms. Reverse: TR POT II COS DE SARM, Pile of arms: cuirass, shields, spears and other arms. Obverse: IMP L AVREL COMMODVS AVG GERM SARM, Laureate, draped and cuirassed bust right. Reverse: TR P II COS P P DE GERM, cuirass, shields, spears, and other arms. Reverse: TR P II COS P P DE SARM, Two captives seated left and right at foot of trophy. Obverse: L AVREL COMMODVS AVG GERM SARM, Laureate and draped bust right. Reverse: IVNONI SISPITAE TR P II IMP II COS P P, Juno Sospita advancing right, brandishing javelin and holding shield; in lower field right, serpent. Obverse: L AVREL COMMODVS AVG, Laureate, draped, and cuirassed bust right. Reverse: TR P III IMP II COS P P, Castor, naked except for cloak seen on breast and shoulder, wearing round cap, standing left in front of horse left, holding it by bridle in right hand and transverse spear in left. Obverse: L AVREL COMMODVS AVG, Laureate, draped and cuirassed bust right. Reverse: TR P IIII IMP III COS II P P, Mars Victor, naked but for helmet and chlamys around waist, advancing right, carrying spear in right hand and trophy over left shoulder.